He knows this is a land of plenty; he works in Whole Foods. 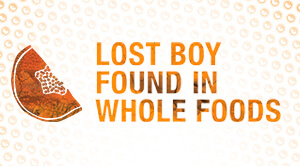 The title Lost Boy Found in Whole Foods may suggest something jocular or whimsical. But Tammy Ryan’s 2010 play of that name aims to be deeper and emotional. In it, a white American middle-aged, clearly affluent single mom connects with a Sudanese refugee working in the market and decides to make his life more meaningful, having him live with her and her teenage daughter. Social responsibility and compassion are the motivations. To make such intentions manifest cannot come easily. The woman, inevitably, finds that she had been losing something of her own. She may find a path to clarity. This was, of course, not a unique event. Widespread brutality, deaths, terror-stricken migrations and escapes to refugee camps have gone on over and over in many parts of Africa and other parts of the world. The story is alive today, as you know, along Europe’s borders, and deep in tumultuous Middle Eastern Arab lands. This drama, although in Ryan’s hometown of Pittsburgh, could take place anywhere/ She hopes to delve into the vast divide between our own prosperous ways of life and the struggle to survive in far-away Third World societies. And to explore the communality of family ties and diverse senses of self, especially in portraying beliefs and rituals of a culture alien to average Americans. This winner of The American Theatre Critics Association’s 2012 Francesca Primus Prize has a message which is “palpably sad, a comment on fate, unfairness and the limitations of the supposedly indomitable human spirit,” observed The New York Times. Nourishment flourishes along market aisles. Food for thought resides there, too.